‘Transparent’: Any Viewers of this Show Out There? Please Speak Up…. A scene from ‘Transparent’ now streaming on Amazon. …I need to talk it out! I write this blog post bleary eyed and consumed. I binge watched this fascinating dramedy last night, stopping around 11pm when I had to get to bed. But, the characters and the story made my mind bounce with ideas. Screw sleep. I watched some more. Now I’m tired and consumed with the weird, dysfunctional world of the Pfeffermans. Has anyone seen Transparent? 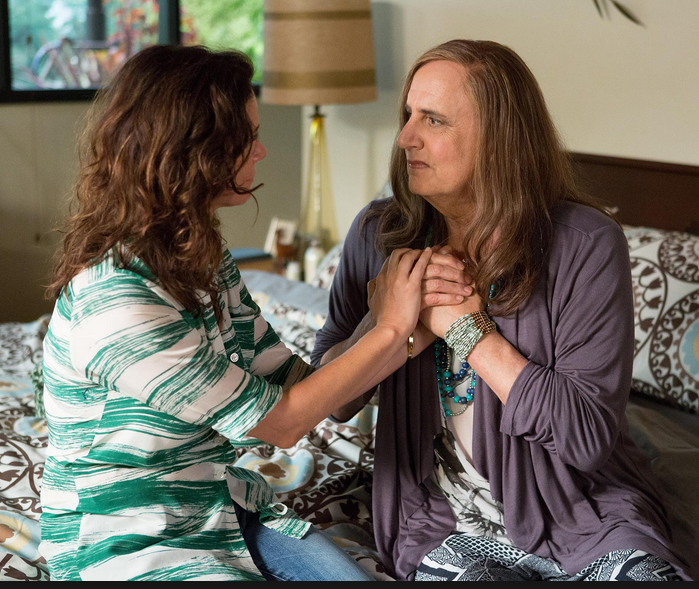 Jeffrey Tambor is extraordinary as Mort, now Maura, a father, after a life of hiding, decides to come out as his authentic self and live his life as a woman. As he defiantly reveals himself as Maura, he has to handle his fucked up family’s reaction (mostly positive – one negative) – where, thanks to flashbacks, the weakened groundwork for emotional sink holes were laid down a long time ago. With every episode running through my head, mishmashed with subtext and psychological elements so deep, it feels downright icky going into the rabbit hole with this loving, passionate, twisted family lost in a whirlpool of change. I’m still trying to let every twist and turn sink in before I can even deconstruct the complicated elements of this clan, the multi-faceted mishegas. Jill Solloway is a genius in creating this fascinating story. There are still three more episodes on my queue to view. It’s taking all my energy not to watch these at work. (My entire team is in France for a conference, so things are slow) But word to the cubicle dwellers – streaming this show is really, really NSFW. Any ‘Transparent’ viewers out there? Please comment! I want to start a conversation. Categories: As Seen Streaming | Tags: Amazon, Jeffrey Tambor, Transparent TV | Permalink.